Marvel Studios may have just netted its first casting addition to star opposite Scarlett Johansson in their upcoming Black Widow spinoff. According to The Hollywood Reporter, Florence Pugh has begun talks to play Natasha Romanoff’s rival in the film. Her character is described as “a spy on the same level” as Natasha, and “likely her moral opposite.” In the comics, Yelena Belova emerged as a rival Black Widow in the late ’90s. It sounds like Yelena may be the template for this character as well. Currently, Pugh is garnering praise for her lead role in Fighting with My Family, which hit theaters last month. She also starred alongside Chris Pine in last year’s Outlaw King for Netflix. Additionally, Pugh appeared in the AMC miniseries The Little Drummer Girl, based on the novel by John le Carré. Black Widow is said to be a prequel to the heroine’s first MCU appearance in Iron Man 2. This presumably means that Natasha will be portrayed in a less scrupulous light than bef0re. In other words, viewers might gain insight into her time as a KGB assassin before Nick Fury and Clint Barton recruited her to join S.H.I.E.L.D. If Pugh is indeed playing Natasha’s moral opposite in the movie, this potentially means that her ethical compass is more robust than Johansson’s ruthless killer. Earlier this month, it was rumored that Emma Watson was up for a role in the film as well. However, it’s not clear if this was Pugh’s role or if Watson was (is?) being courted for something else entirely. 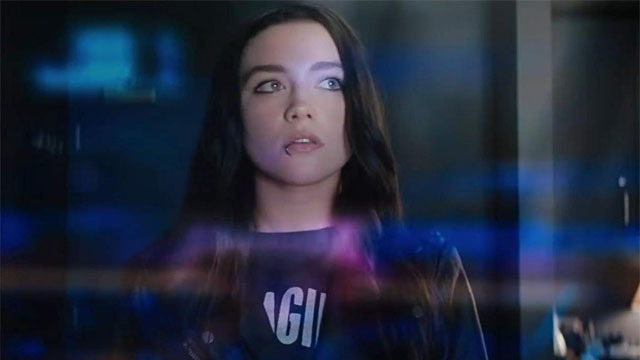 What are your thoughts on Florence Pugh joining the cast of Black Widow? Do you have any other theories about her character? Let us know in the comment section below!